A growing proportion of exports from emerging nations are to satisfy local markets in other emerging nations, or for assembly into products for final export to developed nations. As the graph below shows, despite the huge economic downturn in developed nations, and rapid slowing of growth across Asia, Vietnam has outshone its neighbours in 2011 and 2012, with every prospect of continuing to do so. 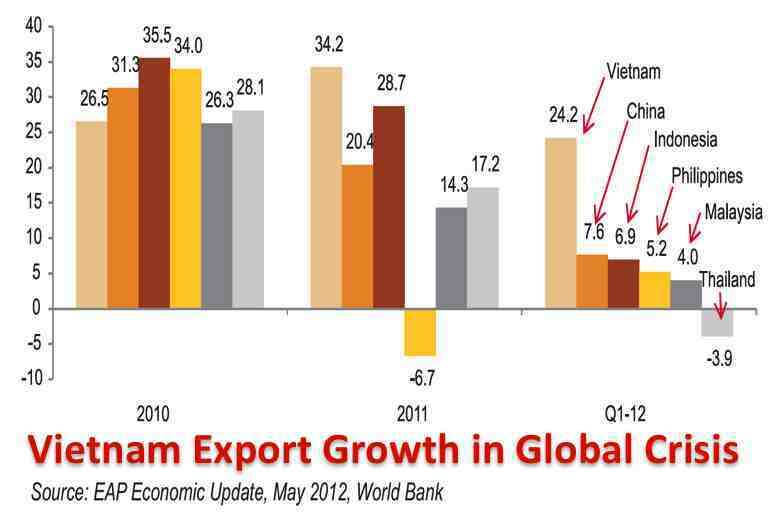 In 2011, exports from Vietnam increased by over 34%, and 24% in 2012. There are a number of reasons for this. 1) Huge Foreign Direct Investment in 2007, 2008 and 2009 – more than $10bn a year, double the normal annual rates of the previous 5 years. Just one investment was a $1bn new Intel factory. Many of these new factories are for computers or mobile phones – with exports more than doubling in a single year. 2) Low labour costs – around half those in China, yet the two countries share a border, and there is only a few hundred miles distance between Hanoi and Guanzhou, one of China’s most industrialised cities. 3) Well educated young labour force – with 98% literacy and a median age of only 27 years. 4) World only recently waking up to Vietnam’s industrial rebirth – the national image has been affected in developed nations by old memories of the “American” war, and of Vietnamese “boat people” fleeing famine to Hong Kong. 5) Government policies to encourage private enterprise, reducing red tape, winding down innefficient State-Owned Enterprises, allowing foreign ownership of larger corporations, investing in key infrastructure. 6) Success brings success – many early investors in new factories have seen great results, which has increased international confidence. 7) Political and eco-stability – compared to recent worries some investors have had over the situation in Thailand, and (for Japanese investors) worries about China-Japan territorial disputes and backlash by Chinese citizens against Japanese-owned factories in China. A key issue is spreading supply chain risk. Many manufacturers were caught out by major flooding in Thailand, with no contingency in place for small but mission-critical components. 8) Growing trade links between Vietnam and other emerging nations. China is importing much of Vietnam’s output as lower-cost components for their own exports. Meanwhile, Vietnam is exporting an increasing range of goods to countries as varied as Chile and Russia, all of whom are themselves growing much faster than traditional destinations such as Europe or North America. 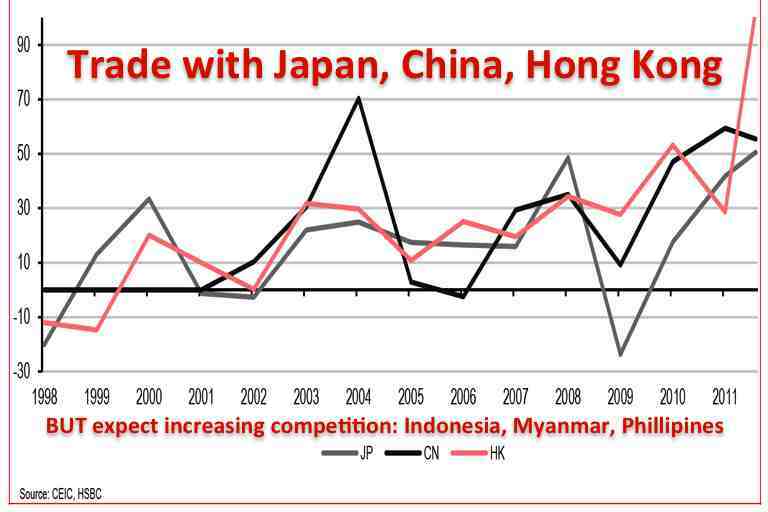 You can how Vietnam trade with Japan, China and Hong Kong has grown. So what of the future for Vietnam manufacturing exports? Expect Vietnam to continue to win significant international investment, which will drive a new wave of higher tech industrialisation. This will underpin growth which would otherwise be over-dependent on rice, fish products, rubber, coffee and other traditional exports. However, Vietnam will be under increasing pressure to accelerate economic and political reforms, to maintain attractiveness compared to other rapidly changing nations such as Myanmar. Investors will expect more liberalised laws regarding foreign ownership of land / real estate, better protection in law, better infrastructure (eg shipping, road, rail, air), more attractive tax concessions, easing of Visa restrictions, opening up State Owned Enterprises to true competition without distorting subsidies, and so on. Further movements of labour from countryside to cities, will help supply factories with more labour, but this in turn will depend on an agricultural revolution, to increase food output rapidly, using less people. This same urban migration will place increasing strains on infrastructure and threaten quality of life in cities, unless city investment also keeps pace, together with effective city-wide planning. * What are your own views about manufacturing growth in Asia? Or on the future of Vietnam's economy? Do comment below. I will reply to each one.